We’ve heard a lot about how monetizing mobile content is difficult in the context of Facebook’s recent IPO. A lot of the company’s growth is coming from mobile, after all, but it’s currently very hard to make money of this mobile traffic. 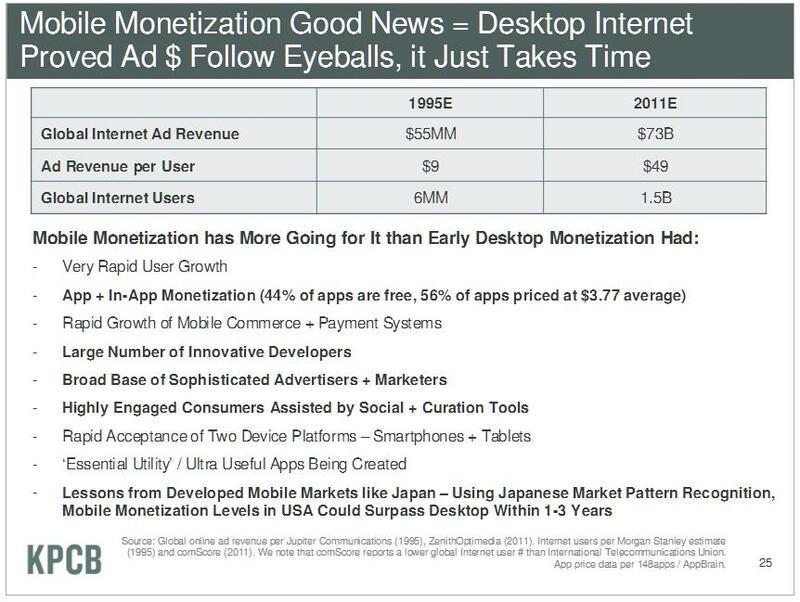 At AllThingsD’s D10 conference today, Kleiner Perkins partner Mary Meeker released her annual overview of Internet trends and she, too, highlighted this mobile monetization problem. At the same time, mobile monetization is also growing rapidly, though 71% of the revenue there is coming from apps and only 29% from ads. Generally, ad spend tends to line up with the amount of time we spend with a certain medium and while we currently spend about 10% of our time with mobile devices, only 1% of U.S. ad spend currently goes to mobile. 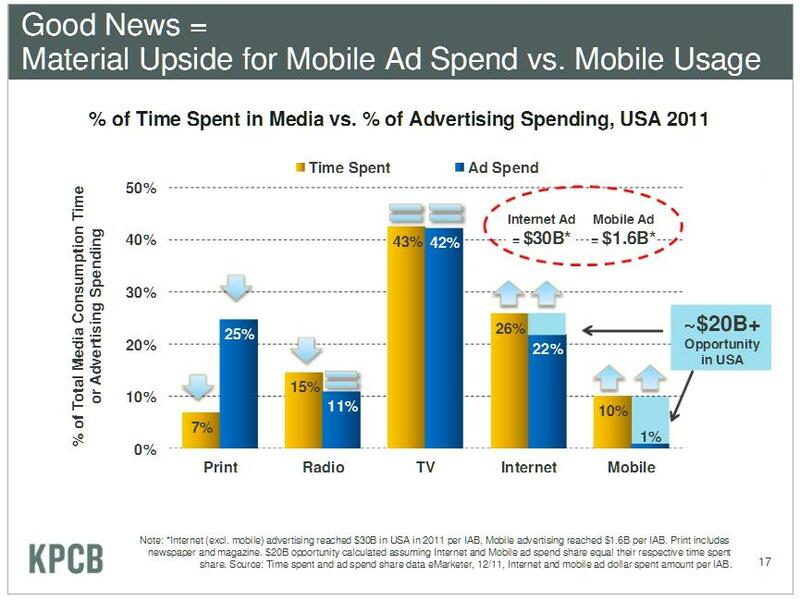 According to Meeker, there is generally a lag between the increase (and decline) of the time we spend with a certain kind of media and ad spend catching up with it, so in her view, it’s really only a matter of time before mobile monetization catches up. For the time being, says Meeker, eCPMs still remain 5x lower on mobile than desktop and the average revenue per user (ARPU) also remains far behind on mobile. 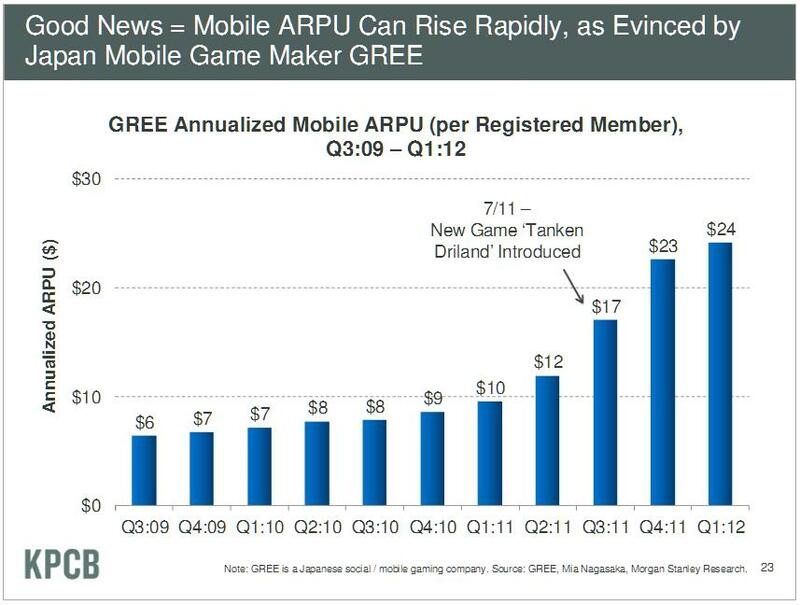 Meeker, however, highlighted that some companies, including Japanese social/mobile gaming company GREE, which managed to increase its average revenue per registered member from just $10 in early 2011 to over $24 in the first quarter of 2012. Another Japanese mobile gaming company, CyberAgent, now sees a higher mobile ARPU than on the desktop. You can find Meeker’s complete presentation here.